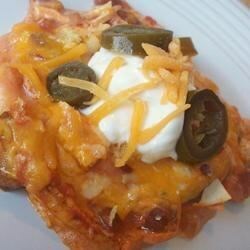 "A great enchilada recipe for a hot summer night, and all you have to do is pair it with a salad and rice! It's best when you let it cool and set for a bit (but my sister likes it best piled on top of tortilla chips). Serve with Mexican rice and a salad if desired." In a large bowl, mix sour cream, salsa, cream of chicken soup, onion and chili beans. Layer the bottom of a 9x13 inch baking dish with 1/3 tortilla strips. Top with 1/3 chicken, 1/3 sour cream mixture and 1/3 Cheddar cheese. Repeat layering with remaining ingredients. Bake in the preheated oven 20 to 30 minutes, or until golden and bubbly. Let stand about 10 minutes, or as long as you can stand it!!! You're done! Used corn tortillas instead, added a can of diced tomatoes and green chiles, used black beans instead of chili beans, cooked the chicken in taco seasoning, wonderful!!! This casserole has become a staple in our family. I never use the whole can of cream of chicken though because it has a tendency to overwhelm the mixture. Other than that - perfect!